Training exercises for ballet, by ballet training experts! 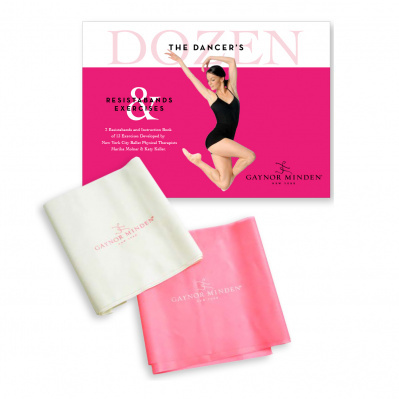 The “Dancer’s Dozen” kit by Gaynor Minden includes two exercise bands of different resistance strengths and an illustrated flip-card style instruction booklet. Devised by the physical therapists at NYC Ballet, who better to provide expert training advice to dancers? Inside you’ll find clear guidance on thirteen different dance-specific exercises to improve your strength and flexibility. Also included is a protective pouch to keep the bands and booklet together, which can be conveniently stored in your dance bag for easy usage.